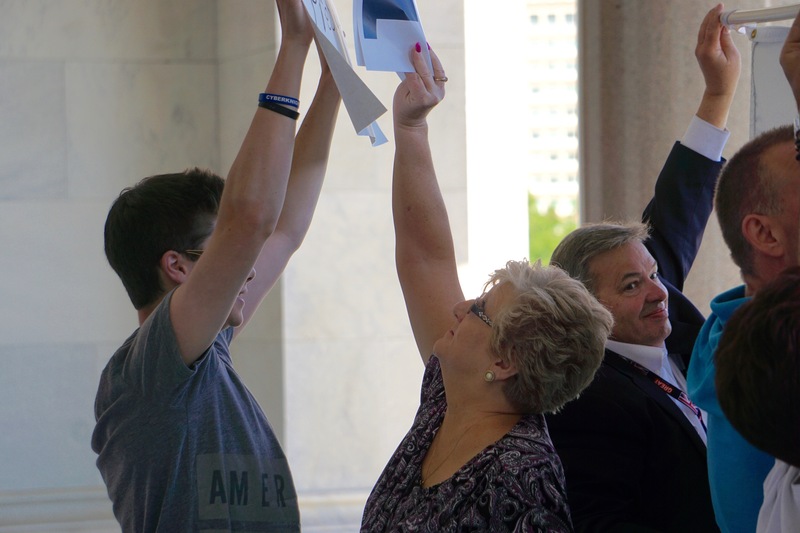 A Timothy Herbst supporter, right, tries to block a protester’s sign. They performed on the north steps of the State Capitol, long a stage for politicians and protesters. Herbst and Norquist had the only speaking roles. 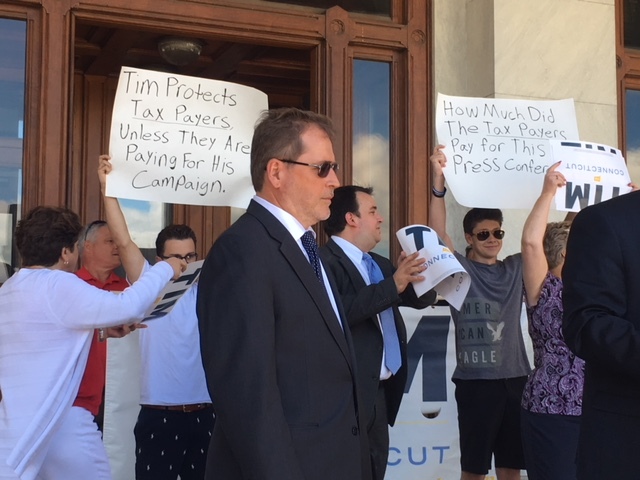 But behind them, two uninvited college-age men made an unexpected entrance, unfurling signs suggesting that Herbst’s acceptance of public financing for his campaign undermines his claim as a tax cutter. As Herbst and Norquist spoke, the candidate’s supporters and the two walk-on performers wordlessly jostled for position behind them. Herbst’s crew held a banner higher and higher, blocking the two signs. The men responded by sliding left and right in a silent tango with Herbst’s supporters. An audience of reporters watched. The young men, who declined to identify themselves, said they worked for no other campaign, though their signs repeated a talking point offered earlier Monday by Bob Stefanowski, one of the two GOP candidates opting out of the voluntary public-financing program. Behind Grover Norquist, center, supporters of Tim Herbst rush to block two protesters. Herbst, who is no stranger to aggressive campaigning, seemed more amused than bemused by the intrusion. “As someone who is feisty and loves a good political fight, it doesn’t bother me at all,” Herbst said later. And might the episode be a harbinger of rising temperatures in the campaign? Herbst, Stefanowski, Mark Boughton, Steve Obsitnik and David Stemerman are engaged in an unprecedented five-way fight for the GOP nomination that will be resolved in an August 14 primary. Herbst dismissed Stefanowski as a latecomer to the Republican Party who failed to vote in U.S. elections for long stretches, including times when he was an executive working in Europe. He was a registered Democrat in Madison as recently as last summer. 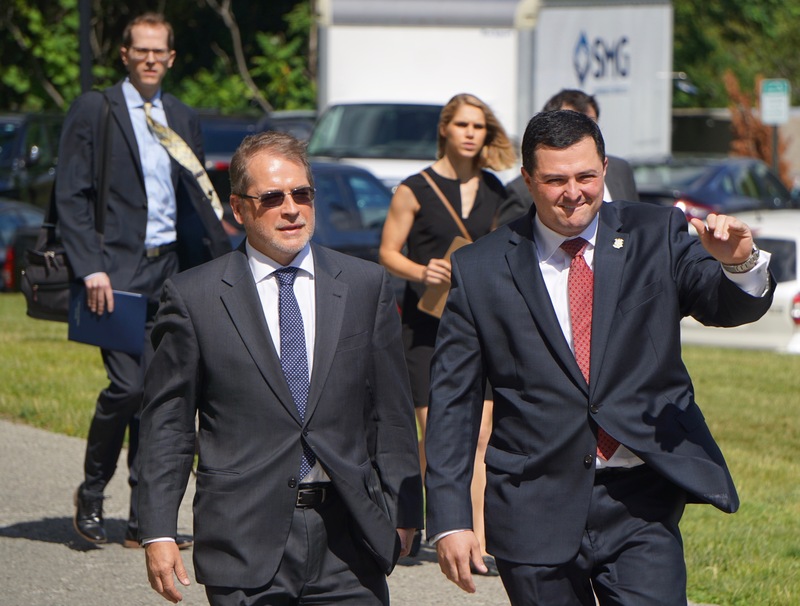 Stefanowski, formerly the chief financial officer of UBS Investment Bank and a senior executive at GE, delivered a pre-emptive jab at Herbst, the former first selectman of Trumbull, over the pledge signing with Norquist. Herbst, it turns out, is not the first of the Republican candidates to take the pledge. Stefanowski also noted Herbst raised taxes while he was first selectman of Trumbull. Herbst, Boughton and Obsitnik are participating in the Citizens’ Election Program, which was created in 2005 to blunt the influence of political contributions in Hartford. It provides grants of $1.35 million for a primary and $6.5 million for the general election to major-party candidates who qualify for the program, mainly by raising $250,000 in contributions of no more than $100. The State Elections Enforcement Commission approved grants last week for Boughton and Herbst, but not Obsitnik. His application will be reviewed for a fifth time this week. Stemerman, a former hedge-fund manager who is self-funding his campaign, announced earlier Monday he was pledging another $10 million to his race in addition to the $2.8 million he already has spent. Stefanowski is relying on a mix of his own funds and private fundraising. In his April 10 filing, Stefanowski reported contributing $500,000 to his own campaign and raising another $260,000 from others. The winner of the primary is likely to face Ned Lamont, the front runner in a Democratic primary with Bridgeport Mayor Joseph P. Ganim. Lamont, who is self-funding his campaign, has a track record of being generous to his own campaigns, spending $20 million on a U.S. Senate race in 2006 and $9.6 million on a Democratic primary for governor in 2010. Patrick Trueman, who is managing Stefanowski’s campaign, said his candidate will be competitive. “He certainly is willing to more than match the Lamont figure,” he said. As for Stefanowski’s recent history as a Democrat, Trueman said he has plenty of company, starting with Donald J. Trump. Timothy Herbst, right, arrives with Grover Norquist.